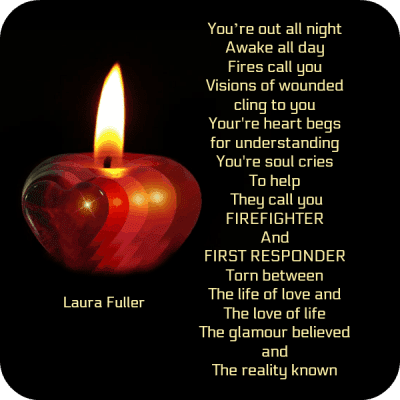 Chris, a friend of mine, said, “I have a challenge for you.” He requested I write a piece about firefighters. He is a volunteer firefighter. I always love a good challenge, so naturally, I accepted. Chris is very proud of the job he does. He loves the rush of adrenaline that flows when that first call comes in. He rushes to meet the needs of the one who calls. He slides gracefully down the fire pole runs fast and furious to his big red fire engine. He is swiftly coming to rescue you from your fires or extricate you from your vehicle. He flows in with ease and works quickly. When he has saved lives, he bows in front of a crowd of applauding people. Chris is a hero! The world view firefighting as glamorous. Movies depict a firefighter as a hero who swept in and rescued you with a perpetual smile. The reality of life as a firefighter is nowhere close to the picture I have painted. In the real world as a firefighter, you are underpaid and away from home for long hours. Or if you are a volunteer firefighter you receive no pay at all. You work 2 or 3 jobs to pay the bills. The long hours are not always action packed and fast paced. Often you will sit at the fire station waiting for that tone to sound. A lot of people think they would love to sit around and get paid to do nothing. No, you would not! These guys and girls are away from their families for 24 hours at a time. They miss ball games and dance recitals just to be available to help you when you need them. They are married to men and women who want their partner at home in the evening. The partner of a firefighter often feels like a single parent. You want desperately to be there to love and hold your family. The long hours away from home keep you from doing this. You want to participate and be a daddy or mommy the way you dreamed of when you were growing up. You have a calling to help others. Your heart yearns to help the people in your community. I know you love it when the tones go off. Your body tingles with fear and excitement of the sound. When you arrive on the scene, you find a home engulfed in flames and a young child trapped inside. Your fear could readily consume you. You don’t allow it to show in your actions or your face. You move forward and do what you know best. You save a child. You are exhausted and head back to the base to wait for your next call. There is no applauding crowd to cheer you on and congratulate you. You will sleep with the vision in your head of panic on that child’s face. You will forever see the look on the parent’s eyes when they realized their child was safe. They may never see that firefighter again, but they will always remember how they felt to have their son safely back in their arms. The only satisfaction you require from a job well done is knowing that you answered the call to help. You were there when that young child was fearful and needed you. He is still alive to laugh, play and grow because you are doing what you are called to do. I have given you a picture of the life of Firefighters, First Responders, Paramedics, and EMTs. They all do this because of a longing to help regardless of the sacrifice they have to make. Please hug a Firefighter or Medic to let them know you appreciate them. They are here for you!